What a weekend! My trip to Norway has been great. Most of the competitors arrived on Thursday, coming from as far as South Africa and as close as Trondheim. It was a good mix of people; on the girls side there was Alex Puccio, Hannah Midtbo, Maria Davies Sandbu…. and me and for the men; Daniel Woods, Dave Graham, Carlo Traversi, Magnus Midtbo and Nalle Hukkataival. We all headed to Lillehammer where the competition was to be held. On Friday morning we were given numerous holds, plenty of assistance and four hours to set a boulder problem. This was the bit I was nervous about. I haven’t got a lot of setting experience and it is quite hard to get the balance right in this kind of situation. You want your problem to be hard of course, but not too hard. I wanted to be sure I could climb it, but I also wanted it to challenge the other competitors. In addition, I was very keen for it to be interesting for the crowd; an exciting problem to watch, combining different styles. The key, of course, is to play to one’s strengths. I looked around for the smallest holds I could find. I played around for hours with my problem but when I finished I was actually pretty pleased with what I had created. And I knew I could climb it. We had some lunch and chilled out for a bit before returning to the boulders to test each other’s problems. We started with Hannah’s; a steep problem, fairly long, with big moves between good holds. Maria’s problem was next; again very steep and long, good crimps and ending on a high heel hook move that felt a bit insecure. Then Alex’s problem…..unbelievable! Her problem was her style in its purest form; steep, big moves between bad, slopey pinches, very basic and very hard. Having tried them all I knew I was capable of climbing three (mine, Hannah’s and Maria’s). However, they were all hard so anything could happen. That evening we were taken to dinner where we tried a Norwegian special: Moose stew. It was delicious! The next day we all felt pretty sore from the setting and the climbing session. We headed to the local wall for two Boulder Jam sessions. These were informal competitions for people who had travelled from all over to watch The Battle. We spent the day talking to people, helping with beta and generally being a part of the event. That evening we put our aches and pains aside and got ready to climb in the competition. Hannah’s problem was first. This was the one I was most worried about; it had been the hardest for me (apart from Alex’s) in the testing session. My first go was the best but a combination of tiredness and slippy holds (we had had some rain earlier in the day) meant I didn’t make the crux move. Each go after that I got worse, my tiredness was starting to show already. Only Alex managed to top the problem, flashing it with ease. Maria’s problem was next and we all managed to climb it. Then we moved on to Alex’s…. Hannah, Maria and I all had a good go but we couldn’t do the moves. Alex flashed it, wowing the crowd with her incredible power. Finally it was time for my problem. 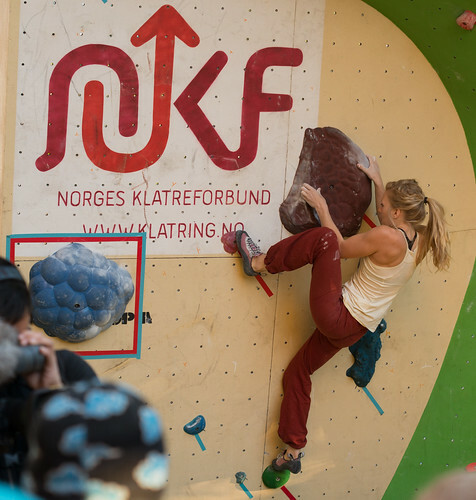 The start of Hannah’s problem, Photo Lars Verket. 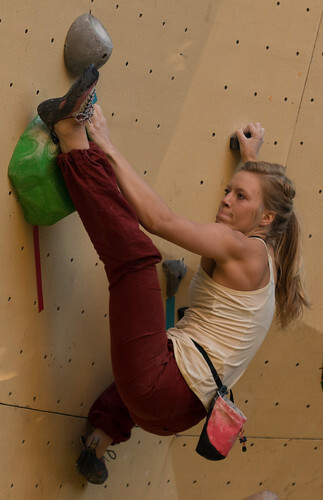 Further along on Hannah’s problem, Photo Lars Verket. At the top of Maria’s problem, Photo Lars Verket. I was last to climb so I could watch everyone climb first. Hannah did well but wasn’t able to manage some of the crimpy moves, Maria was the same. Alex flashed right up to the end before falling. I had put very poor footholds at the end of the climb which required very careful foot placements and tension. She tried again and managed it second go. Now it was down to me and I was nervous! I pulled on to begin the climb with a jump. When I got to the crimps I went onto automatic and just pushed through the moves to the top. I was really happy, I had done my problem and it had put me in 2nd place :). A big well done to Alex for coming in first, she was clearly the strongest and she deserved it. We then settled in to watch the men. Their problems were really mixed in style, and very exciting to watch. They all climbed brilliantly, with some amazing shows of strength and skill. It was Daniel that stuck out as the most impressive, topping all five blocs to win. This kind of competition was really fun and a nice change from the usual format. It allowed for more creativity on the climber’s part and means harder blocs. Some partying and celebrating (it was also Nalle’s birthday) meant we had slightly sore heads the next day. 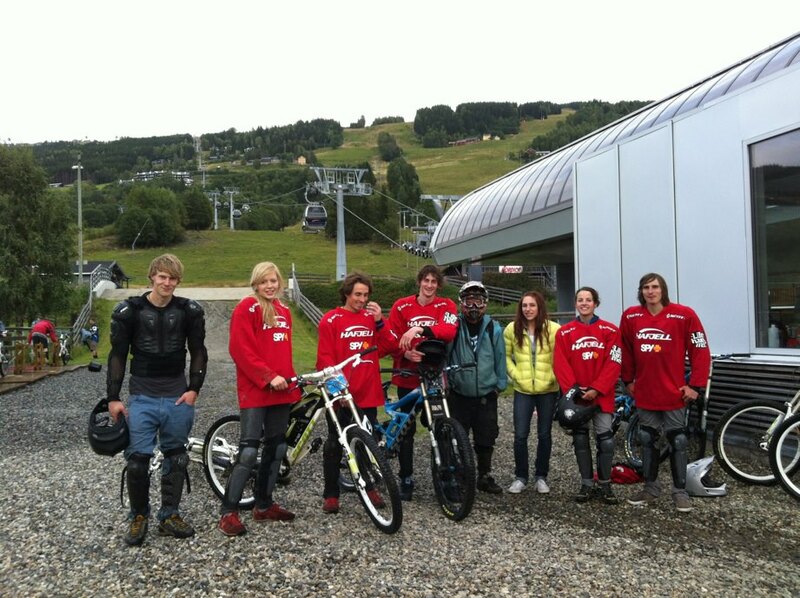 What better to do with a hangover than downhill mountain biking! Thanks to Rune and his colleagues we were able to have a two hour session hurtling down the hillside. This was one of the scariest things I have done but it was brilliant. A key part for me was relinquishing control and just committing to the rocky, steep terrain. A few falls, but no major injuries were sustained and we all had a great day. Now I am home again, preparing to go to London for my sister’s wedding. Best of luck to all those going to Paris this weekend for the World Championships, I will be there in spirit! Just want to say awesome job and that you are such an inspiration!! That is a really neat way to do a competition too. 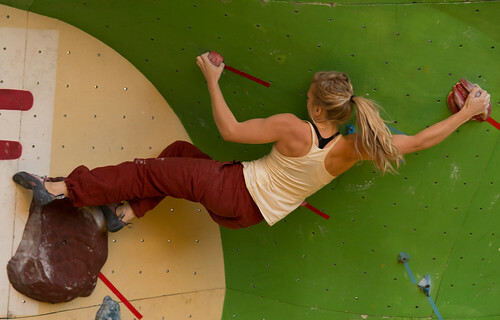 I also love those pants, they look perfect for climbing! Where did you find them? All the best and keep inspiring us ladies to pull harder!